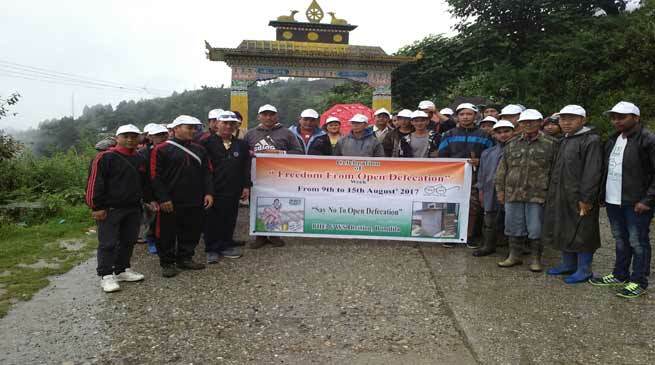 People of Pedung village in collaboration with Department of PHE and WS Bomdila Division has conducted mass Social service ( Swacch Bharat Abhiyan ) on 13th august 2017 at pedung village ( 4km away from main town Bomdila ). Earlier in the morning GB pedung village Passang monpa in his speech cleanliness must be started first from your own house, after that state and national as a whole. Vice chairman Bomdila Multipurpose cooperative society LTd. Lobsang Genchen in his speech appreciate the central Govt sponsor scheme Swacch Bharat Abhiyan Mission due to central sponsor scheme every individual house hold getting toilet. JE Department of PHE and WS Bomdila Division Shri Ato Borang spoke regarding the importance of Swacch Bbharat Abhiyan in the village level. Coordinator sanitation of Department of PHE and WS Nafra block sailesh kumar prasad appeal to the villagers to complete the construction of individual household latrine within mid of September month 2017. In this mass social service about 200 people of pedung village along with workers of Department of PHE and WS Bomdila Division has participated.